Alaska is one of the greatest adventures in the world. A place like no other, its vast wilderness, amazing wildlife, and breathtaking views are unique, exquisite, and absolutely heart stopping. It is a one in a million place to live, especially for those who are adventurers and wild at heart. Each town in Anchorage, Alaska is a special place unto itself, with its own character and charm and Mid-Hillside, Alaska is especially so. Mid-Hillside, Alaska is a town south east of Anchorage located next to the vast and beautiful Chugach State Park. 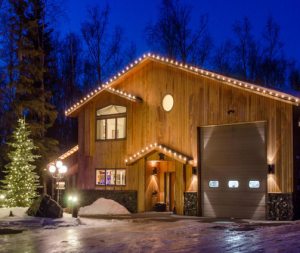 It is a perfect piece of suburban paradise with a little wilderness thrown in for good measure, all within commuting distance to the great city of Anchorage. It is a small town, with local restaurants and a quaint, charming feel to it. There is local shopping from main street stores, contributing to the feeling of a close knit small town. Crime rates are very low and the cozy little town has a distinct family friendly feel to it. School are a big draw in the area with three excellent schools to serve children from grade school through high school. The graduation rate is almost one hundred percent and children come out of high school ready for a bright and brilliant future. Houses have room for land and are upscale custom built homes that are a dream to come in and enjoy, with breathtaking vistas and wide open spaces. Both rentals and homes to buy are available and help to create a wonderous mix of culture. The temperatures are moderate for Alaska, with summer highs reaching comfortably into the mid to high fifties and bountiful sunshine. Chugach State Park nestles up next to Mid Hillside opening up countless trails for hiking, camping, and animal watching. People from all over the world come to hike up Flattop and camp on its flat surface. There are trails for all levels of hikers and markers to help you get back down as well, once you reach the summit of the famous mountain. From the top of the mountain you can see far and wide, enjoying the crisp clean air and multitude of creatures and wildlife around you. Mid Hillside is a beautiful community resting peacefully next to the magnificent Chugach State Park. It is a small town with cozy cafes, friendly neighborhood stores, and charming inhabitants, all with Anchorage within driving distance. Its three schools boast some of the highest graduation rates in the state. In addition the town sits next to a virtual cavalcade of trails, hiking, and camping that comes with the State Park, making it the perfect home for the adventurer at heart.